The ZTE Rapido Z932C is a 4.5-inch smartphone that comes with Android 4.1.2 Jelly Bean. It has a powerful dual-core processor. It was the first 4G LTE enabled device released by ZTE for the Verizon network. It's a CDMA phone and works with the Verizon network so be sure to check that you have Verizon cell towers or coverage in your home area before getting the ZTE Rapido Z932C. Included with the phone are the amazing Straight Talk plans which I will discuss later in this review. The device ships in a Straight Talk box. Opening the box reveals the 4.5-inch device secured in the center of the box. Other items in the box include the wall adapter, a standard USB cable, straight talk service guides and other manuals. So let’s check out the design. I found the outer look and feel of the ZTE Rapido Z932C quite appealing. The slightly rounded corners and the black chrome-like bezel that surrounds the screen make it a device to behold. The arrangement of the USB port, power and volume buttons is quite unique. You will find the power button located on right-hand side of the device, the volume buttons on the left-hand side of the device. The headphone jack is at the top -which is typical for most phones. The USB port is located on the right-hand side of the device- which is unlike most phones. We have the three navigation buttons at the bottom of the screen. The back button is on the left, the home button at the center, and the recent apps button at the right side. All are backlit. At the upper part of the screen, we have the front facing camera and also a notification light. At the back, we have the camera and a LED flash just below it. The back cover is removable to reveal the battery and SIM and microSD card slots. The main speaker of the phone is at the bottom right corner, and not exactly on the back cover – so placing it on a flat surface won’t interfere with the sound output. ZTE Rapido Z932C comes with a powerful 8MP back camera and a 1MP front camera. 8MP cameras are mostly found in high-end phones, so having such a camera on the ZTE Rapido Z932C really impressed me. The picture quality is fabulous. The camera comes with other adjustable features. I experimented with features like a panorama, autofocus, and digital zoom in pro-mode and I surely loved the photos. Also, the camera allows you to apply up to around ten filters even before the picture is taken. In case you take pictures in limited light conditions, the LED flash on the back camera serves well. The front camera takes good selfies. Although short on pixels, I found it to perform well in bright conditions. 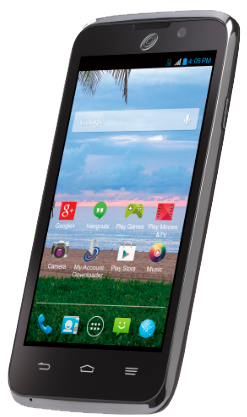 The ZTE Rapido Z932C comes with a 4.5-inch display with a resolution of 1280 x 720pixels. The screen impressed me, really. An entry level device with Corning Gorilla Glass! ZTE stretched on this one. The screen is durable, visibility in the sun is great and very slick on touch. There's very little resistance when sliding your finger across and it made my overall experience enjoyable. Photos that I took from the camera show up brightly. I enjoyed watching a lot of content on YouTube, and the videos looked crisp. The screen is responsive to touch, and you can feel almost no resistance when zooming in and out of images or Google Maps. ZTE Rapido Z932C comes with a powerful 2070mAh battery that does not give up easily. With a talk time of up to 7 hours and a standby time of up to 9 days, it performs well. I found the battery life to be quite good since it could last through a day of typical usage. When gaming or on consistent internet usage, you may need to recharge it to go through the day. Good thing though, the battery is removable, so you can always carry a spare and change it in case you run out of power. The ZTE Rapido Z932C ships with an internal storage of 8GB. I can say this is quite an ample storage for your pictures and apps. You also have the option of upgrading the storage with an external microSD card of up to 32GB. Now with 32GB plus the internal 8GB, you can hold a lot more content on your device. The ZTE Rapido Z932C ships with Android 4.1.2 Jelly Bean. A Qualcomm Snapdragon 1.2GHz dual-core processor powers the device. It's paired with 1GB of RAM making the overall performance impressive. I found the phone to be very responsive to touch, I think this can be attributed to the display, but also the apps launch fast enough so the processor plays a bigger part here. The high-speed 4G LTE is very impressive. When operating within the data plan of Straight Talk, I enjoyed watching videos on YouTube with little buffering. Loading data into apps like Google Maps was also very fast. The phone comes with several Google apps installed, and you can still download more apps from Google Playstore for video streaming, social networking, weather, etc. Another thing worth mentioning is the smooth animations when switching between recently launched apps using the recent apps button. It kind of brings in the idea of multitasking. Other connectivity features on the phone include Bluetooth 4.0, GPS for location services, also remember it is a CDMA enabled phone. 8MP back camera, 1MP front camera. Battery: removable 2070mAh. Talk time up to 7 hours. Standby time up to 9 days. Storage: Internal 8GB, expandable with a microSD card of up to 32GB. GPS Capable for location services.